EasySMX COOL 2000 Gaming Headset | Nerd Much? We were first a bit skeptical when we received the EasySMX Cool 2000 gaming headset. Not because we’ve heard bad things about it or anything like that, it’s just that we hadn’t heard of the brand prior to them reaching out to us. And when our inbox gets flooded with requests to review everything under the sun, we have to do our research and make sure the product is worth presenting to our readers. Luckily, this headset is worth sharing for a few reasons. It has to have the ability to be used with multiple devices. When you have every console and device under the sun like I do — including an Xbox One X, PS4 Pro, Switch, 3DS, iPads, Kindles, laptops, computers, and smartphones — you don’t want to have to buy a good headset for each of them. So, finding one that can be plugged into all of them is a big plus. And when that headset is surprisingly low in price — in this case, only $25.99 — it’s the ultimate win. Now, with such a low price, it’s only natural to be concerned about the quality, even when a product has such a high review rating on Amazon. But the COOL 2000 is actually quite formidable. What’s most notable about this headset when you put it on is its high level of comfort. It has a soft padded headband that makes the headset feel virtually weightless. 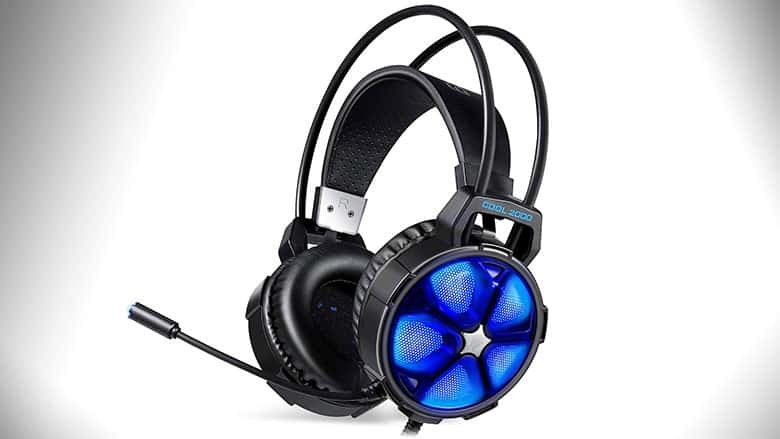 It’s also worth mentioning that not only do the earcups have a cool blue LED glow, but the mic also glows (which is something I haven’t seen before). The LEDs also have a few different options: rotating, breathing, and constant. But possibly even more impressive is how great it sounds. Seriously. We’ve reviewed quite a few headsets here at Nerd Much?, so it’s safe to say that we know good audio when we hear it. The COOL 2000’s audio was overwhelmingly impressive for being under $30. The highs and mids are crystal clear, and lows have a good boom to them. And according to our gaming buds, the noise-cancelling microphone sounds crystal clear as well. Simply put, we were surprised by EasySMX’s ability to create a quality headset that both sounds great and is comfortable for under $30. For these reasons, the COOL 2000 headset gets the Nerd Much? seal of approval. Check them out on Amazon.